…then it was Monday and a member of our church passed away in the night, it was also back to our homeschool routine and laundry and you know… life with 6 kids. And before I know it, it’s Tuesday night and it’s been 3 days since I posted a flashy new cake. Oops. 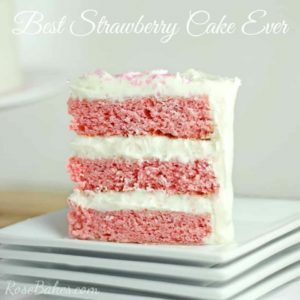 So… as I sit here late Tuesday night… I’m feeling under-the-weather and tired and overwhelmed, I’m gonna cop-on you again and share another short cake post! But tomorrow… I promise tomorrow… I’ll share a bright, happy, new cake with lots of details! 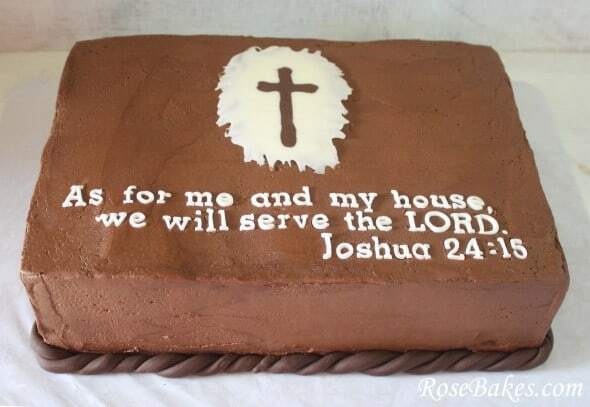 Anywho… that sounds like this cake is inferior… it’s NOT, it’s just easy to talk about because of it’s simplicity! This is a chocolate sour cream cake with chocolate buttercream. I made the rope border with dark chocolate fondant. 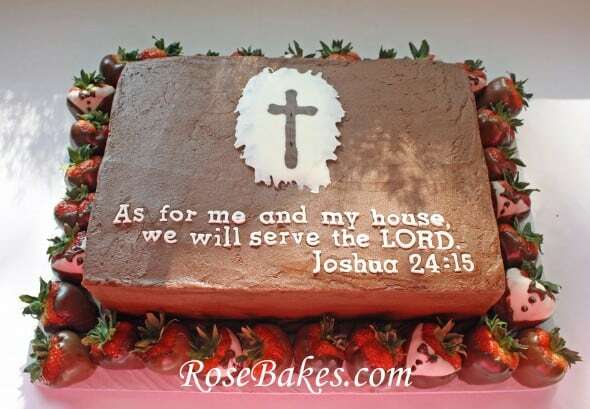 The letters were done with Satin Ice gum paste and the Block Tappit Letter Cutters. 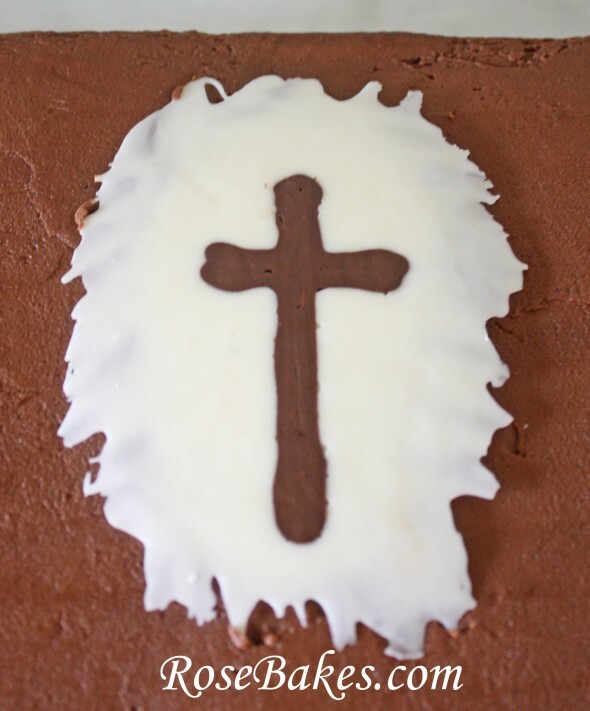 For the cross, I piped some melted chocolate onto wax paper in the shape of the cross, the stuck it in the freezer for a few minutes. Then I spread some melted white chocolate over that and smeared it around the edges. Back into the freezer for a few minutes, then I laid it on the cake (wax paper side up) and peeled it off…. wah-la! 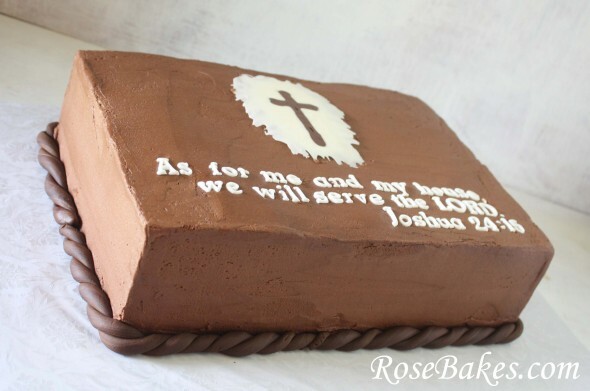 Browse through all of my roses cakes here. I did that cake way back in May 2010. It was red velvet cake with cream cheese frosting and covered in chopped pecans. 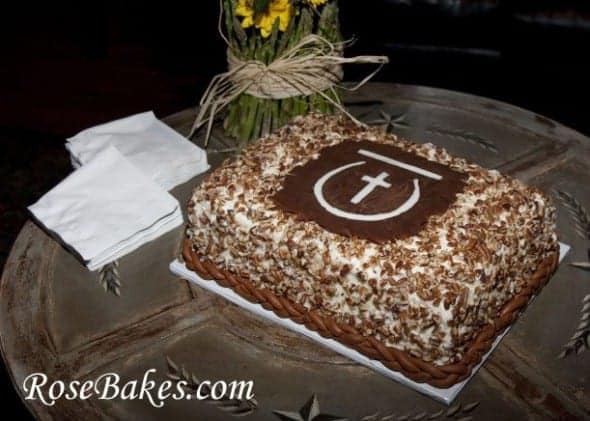 The cross and horseshoe on this cake are a replica of my brother’s brand (he’s a farrier and horseman). You can see their gray and yellow wedding cake here. Oh well… so this post wasn’t so short after all. But I must wrap it up now – I still have a fondant monkey to make tonight!! Do you have any questions about these cakes? Please leave them in the comments and I’ll do my best to answer and help out! 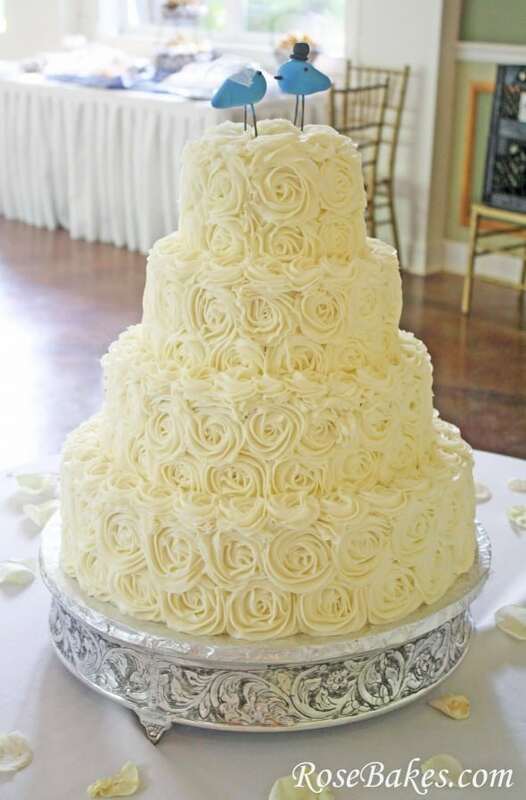 I LOVEEEE that buttercream ivory rosette cake. I’ve asked a cake shop to make it for me and would love if you could please give me the dimensions that you worked off for that cake (hey I’d ask you to do it for me but we’re from the land down under). Hello down there in Australia!! That cake had 6″, 9″ 12″ and 16″ tiers. Each tier was about 4″ tall.